Big money is being made by members of the so called "mainstream" media with sensational style of reporting that is putting billions of dollars in advertising because of the public's increasing thrust for blood. HAMILTON, Ontario - Oct. 14, 2016 - PRLog -- Fox and other mainstream media are closing down their traditional newsrooms with professional ENG (electronic news gathering) photojournalists and will be replacing them with "citizen journalists" who will be paid for the video footage that they supply to media newsroom and media distribution agencies from their own cell phones and digital cameras. From protests to natural disasters to terrorist attacks, civilian journalists, looking for that almighty dollar, will be soon be supplying the footage that you will be watching. This move leaves the future of professional journalists, photojournalists and journalism schools up in the air. 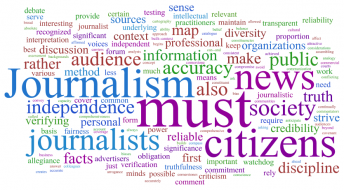 To become a civilian reporter, you no longer need a certificate in broadcasting from such institutions as Niagara College in Niagara Falls, Ontario or Mohawk College in Hamilton, Ontario. All you now need is a cell phone. All that is now necessary to get the video from the street to the master control of a news agency to TV network is taking the image (still, video and audio) and sending it to designated email addresses or other designated data dump locations. The media outlets no longer have to pay the salaries of photojournalists and the expenses associated with newsroom operations. The more the media saves on the daily operation costs, the more of the advertising dollar they have for their bottom line and shareholders. This is yet more proof that mainstream media is continuing it's decline of professional news reporting to the tabloid journalism. The switching over to tabloid journalism can best be seen in recent months on CNN - where they have embarked on public bashing of Donald Trump and openly supporting Hillary Clinton with their biased hosts, biased reporting, biased features, and plain disregard for the truth. The end of the responsible way of reporting news to the public will be replaced with more talk form venues like CNN's morning show, The View, Good Morning America, all spewing out the negative news that corporate programmers shareholders and their advertisers live for. News is a money making industry. According to , Deborah Serani, Psy.D., psychologist and psychoanalyst"Gone are the days of tuning in to be informed straightforwardly about local and national issues. In truth, watching the news can be a psychologically risky pursuit, which could undermine your mental and physical health." Dr Serani went on to say, "Fear-based news stories prey on the anxieties we all have and then hold us hostage. Being glued to the television, reading the paper or surfing the Internet increases ratings and market shares - but it also raises the probability of depression relapse. In previous decades, the journalistic mission was to report the news as it actually happened, with fairness, balance, and integrity. However, capitalistic motives associated with journalism have forced much of today's television news to look to the spectacular, the stirring, and the controversial as news stories. It's no longer a race to break the story first or get the facts right. Instead, it's to acquire good ratings in order to get advertisers, so that profits soar." Does this sound familiar? This is what I have been saying for years. Why would anyone appear on shows such like "The Steve Bilko Show," "Jerry Springer", and "The Maury Show?" Are people so screwed up that they will do anything or say anything to get their 15 minutes of fame? The answer is a simple, "yes." How come we never see mainstream media going after these shows who mirror what the media is accusing Donald Trump of doing? The answer is that members of the media stick together protecting themselves while using you, the audience, to get rich from the advertising dollars they generate from you watching their programming. These shows, which have stayed on air for so long give members of their audience the exact type of programming that is found in the news media. Sensationalistic so called "news" programming has only one goal: to get as much advertising dollars they can which is based on the number of viewer they get. Members of the audience, including Facebook which uses your stats to line their pockets with advertising dollars, are a bottom line number that is then transformed into advertising dollars. Remember, "If It Bleeds, It Leads." For The 'X' Zone Radio/TV Show and The 'X' Chronicles Newspaper, I am, Rob McConnell. Visit The 'X' Zone Broadcast Network at http://www.xzbn.net. Derrel Sims "The Alien Hunter" Exposed! Jesus Christ and King Arthur Are The Same Person And Ralph Ellis Proves It!